It would be great to be able to look inside Les Claypool's head. The man behind Primus writes some rather twisted music. Primus' songs already have some mildy insane lyrics. In his other projects this isn't any different, as he already proved in his solo work and for example in Oysterhead. It has to be quite an experience to see from what well these crazy lyrics and music originate. This time he formed the duo Les Claypool's Duo De Twang with his good friend Bryan Kehoe. On Four Foot Shack they limit themselves to only a few string instruments and a "mini-tambourine-doohickey" for the rhythm. The duo is mainly drawing inspiration from American folk and country music. That's why you'll hear famous folk songs like 'The Bridge Came Tumblin' Down', by Candadian folk singer Tom Connors, and 'Battle Of New Orleans' by the legendary Jimmy Driftwood. Of course everything was pushed through the "Claypool-filter", so it bears unmistakably his signature. Both musicians wanted to play songs they are listening to themselves a lot. 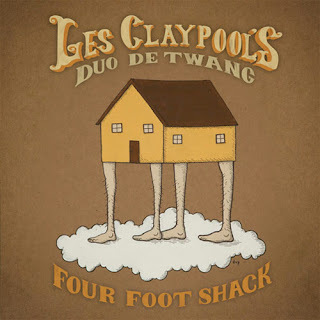 That's why, besides Claypool's own compositions and the popular folk songs, a few cover songs were added to the record. The Bee Gees' disco super hit 'Stayin' Alive' is almost unrecognisable in a genuine Hillbilly version. They got rid of the grunge layer in Alice in Chains' 'Man In The Box'. It is one of Claypool's qualities that he's able to adopt to everything. When you like his other work, this record won't disappoint. Sometimes it all gets a bit too cheesy, but that's forgivable. Clearly with a lot of fun, the duo came up with a remarkable record, which only gets better every time you listen to it. Despite the cheesiness it then displays the musical quality of both musicians. Hopefully the well inside Claypool's head is far from drying out. Listen to 'Four Foot Shack' on Spotify.